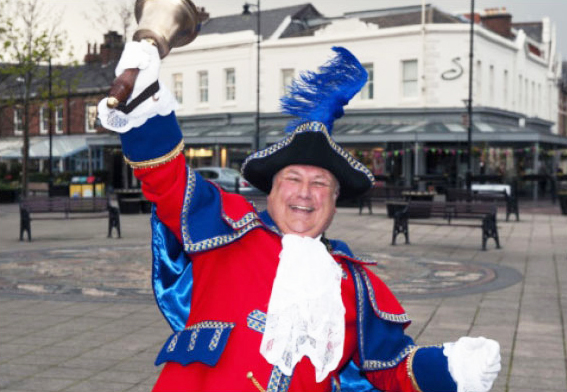 Who better on the launch of the People page than our Town Crier Colin Ballard? Colin has fulfilled the role since being “thrown in at the deep end” on Lancashire Day 2011 wearing an outfit belonging to The Lord of the Manor, James Hilton, and previously worn by last incumbent Eddie Bowkett. WHERE DOES ‘OYEZ’ DERIVE FROM? He has since had a beautiful new tailored coat with the associated badges and emblems made especially for him as well as a bell made by the Whitechapel Bell Foundry in London, which weighs a whopping 7lbs! The bell is rung 3 times before ‘Oyez’ which is from the French for ‘hear ye’ and is traditionally used at the opening of courts on the continent and in America today, before reciting the declarations which he writes himself. Apart from a background in education that has been equally challenging and rewarding, he is most proud of a lifelong association with the Queens Scouts. He relishes the role and has been involved in all the major local events over that time, the Olympic Torch Bearing, The Open, Queens Jubilee as well as the multitude of Public and Civic occasions. WHAT MAKES A TOWN CRIER? Although he hopes to be doing it for a while yet, he may “retire” somewhere down the line… so get yourself a bell and start practicing your projection!! Colin also is an excellent Toast Master and Master of Ceremonies.